It is hard to believe that the 2016-2017 school year is coming to a close. It has been an excellent school year! On Saturday, June 17th, we will say good-bye to some wonderful young ladies and gentlemen. Graduation from elementary school is a very special event. It marks the end of the first and longest part of a student’s educational journey. Some of our kids have been here since they were three years old! It also means that we will say good-bye to some pretty terrific parents. So, please join me in thanking and acknowledging all of our graduates and their parents, especially those parents who will also be leaving Hoboken Catholic Academy on Saturday, June 17th. The student names marked with a * indicate that they are the last in their family to attend Hoboken Catholic Academy. Earlier today we sent our Pre-K and Kindergarten students off for the summer at their respective graduation ceremonies. The students at both ceremonies processed in wearing their caps and gowns, sang some songs and enjoyed the love of their families, their teachers and each of us in attendance. As I watched both ceremonies I could not help to think about the magical journey of childhood and the importance of the relationship between home and school. We are blessed at HCA with amazing children. I often thank you because it is no secret that amazing kids come from amazing families. Your support of our school, our teachers and our mission is evident in all that you do. Our year began with the completion of our air conditioning project last summer and the installation of two new water fountains. During the last few sweltering days, when other schools were forced to close early, our students and teachers really appreciated the new AC. We have continued to upgrade our facilities by installing the new security gate in our courtyard and removing the old roll-down gates from our entrances on 7th Street during Easter break. We installed new lighting in our first and second floor lavatories, also during Easter recess and will remove and replace all of the outdated stalls over the summer. In addition, we will paint the worn tile floors in each bathroom with epoxy paint, completing the much-needed overhaul. In addition to upgrading our student lavatories, we will reconfigure the first floor classrooms adjacent to the kitchen, turning three small rooms (maximum 16 students) to two rooms that will be able to accommodate 25 students. 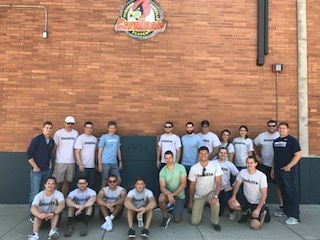 Thanks to John Bartoli, the project leader, and HCA parents Eric Peel and Abram Pretorious who along with sixteen colleagues from Deloitte and Touche, the school’s foundation received a much needed paint job, during their company’s Impact Day, on June 9th. In addition to the painting, the men and women from Delloite cleaned out the HSA room above the gym and replaced shelving in that room as well as in the Second Season Shop. With help and guidance from of HSA members Jen Araneo and Caterina Bartoli, the group did an amazing job in organizing both areas and discarding broken shelves and outdated or broken items. Not only did our friends from Deloitte donate their time, but they also paid for the paint and all of the new shelving! The windows on the Madison Street side of the building will be resealed, eliminating the leaks in some of the classrooms and preventing the need for costly repairs down the road. We will install full size lockers for students in grades 5-8, eliminating the clutter in their classrooms and allowing for easier movement and more time on task. Our students continue to make us proud with a number of accomplishments, both academic and extracurricular. 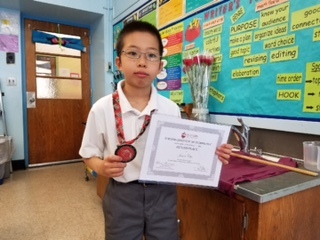 From our eighth graders’ high school selections and over $320,000 in scholarship offers, to individual awards like eighth grader Nicole Vij winning the Hoboken Veterans’ Day Essay Contest and Juliette Vergara winning the Hoboken Rotary Fourth Grade Spelling Bee, and most recently, third grader Jason Chu placing second in the prestigious Stevens Institute of Technology Mathematical Olympiad just last week, HCA students have excelled. Once again, more than 250 students participated in our sports program, More than fifty students as young as Pre-K 3 ran track. In fact, several dozen students completed our HSA sponsored 5K, one mile and Kids Dash Races earlier this month. Thanks to all of our volunteer coaches for their dedication to our student athletes. Your hard work and commitment to our students is greatly appreciated. Our choir performed beautifully each time they were asked to sing. They made more than a dozen appearances and participated in the annual Archdiocesan iSing competition. Once again, our choir, under the direction of Laurie Campana, was rated “Superior,” by the iSing judges, the highest level possible! The highlight of the year, however, came when the choir sang a beautiful rendition of “Shenandoah,” for His Eminence, Joseph Cardinal Tobin, Archbishop of Newark, at his reception in our gym after taking part in the beautiful Mass he celebrated at St. Ann Church. His Eminence listened intently as our beautiful students sang their hearts out for him. Many of our older students were part of Student Council, the National Junior Honor Society or Campus Ministry. They collected hundreds of pounds of food, dry goods and clothing and scores of toys for sick children in local hospitals. They hosted our Thank-you Dinner/Dance for their parents and grandparents in May and finished the year by collecting a dozen boxes of paper good, coffee, cereal and other items for the Hoboken Homeless Shelter. Our seventh and eighth graders logged scores of volunteer hours, assisting our littlest students enter school each day and travel to and from church for monthly masses and during our evacuation drills, babysitting for Home and School Association meetings as well as volunteering at countless HSA and school events. They served as tour guides during open houses and always represented our school and our families in a positive way. Our children truly live the gospel message of love and service and have answered Pope Francis’ call to put others before ourselves. I could not be more proud of them. HCA has continued as a Professional Development School this year, in conjunction with William Paterson University, and Professor in Residence, Anna D’Alto, has worked with all of our teachers. She teamed with middle school math teacher, Molly Molino, to provide an afterschool enrichment program. They covered such topics as Fibonacci Numbers and Fibonacci Art, Topology and Network Theory, Tangrams, Fractal Cuts, The Sierpinski Triangle and Tessellations. Students learned and used high-level math in fun and interesting ways and our two resident math experts had the opportunity to work together to benefit our students. We will continue our relationship with William Paterson University and welcome Mrs. D’Alto back next year. This year we welcomed engineering students from Stevens Institute of Technology who offered two six-week afterschool classes on various engineering topics. The sessions were well attended and our students leaned a great deal while having fun through the interactive program. We will continue our subscription to First in Math and students will have access using their current log-on information until July 31st. I am pleased to inform you that our school, Hoboken Catholic Academy, placed 24th in the state of New Jersey, and fourth among Archdiocesan schools who participated in the program! Next year we will work to increase our student participation and look to move up in the statewide rankings. Students completed the year by reading just over 1,000,000 minutes! Thank you for emphasizing the importance of reading and thanks to our students for all of their hard work. As has been indicated in a previous letter, we have still not received the Terra Nova parent reports for individual students and don’t anticipate receiving them until August. The schools office is in the process of trying to rectify the situation to avoid this problem moving forward. As soon as I receive any new information I will pass it along. We will continue our STEM initiative and take part again on the Archdiocesan STEM Expo program. Following its highly successful initial year, the program will be revised to enhance it even further. Next year the focus will include more mathematics in addition to the science component. Mr. Taormina was trained at Stevens Institute on the Waterbotics Program, which will be included next year as well. Middle school students will be issued iPads in September for use in all of their classes. Teachers were given their iPads and have received training. They will have their iPads over the summer to explore ways to enhance their instruction. We are all excited about the possibilities! We continued our partnership with St. Peter’s Prep and their Ignatian Scholars, and once again, our friends from St. Peters did a great job working with our students and in various capacities, including tutoring and enrichment. We will continue the program in the fall and look forward to another great year of The Prep Connection! Finally, our school has been featured in the Spring/Summer edition of Hoboken 07030. The magazine is available at various stores and businesses in Hoboken and is published online. We have several copies available in the office for anyone who wants to stop by to pick one up. As we prepare to bring another school year to a close, please know that the teachers, support staff, and I know how truly blessed we are to be able to be part of a school with such wonderful children and outstanding families. We appreciate your support and will continue to work hard to move Hoboken Catholic Academy forward next year and in the years to come. Please have a great summer and be safe.